Since Gregg and I don't have a child yet, we treat Sampson our Golden Beast like our kid. Every time we're out shopping we feel compelled to buy him a new toy, accessory, or delicious treat. We're always on the hunt for some stylish new pieces whether it's a bandana, collar, or leash. Needless to say, Sampson is a very spoiled boy. I stumbled across this new company Leeds Dog Supply, and not only do they have super fun printed collars and leashes they also donate back. Leeds Dog supply is made in the USA and they give back to no kill dog shelters and rescues. 15% of the proceeds go back to a rescued dog in need. So why not kill 2 birds with one stone- buy a new collar/leash and your purchase will donate 15% back to a dog in need. Talk about starting off the new year right! 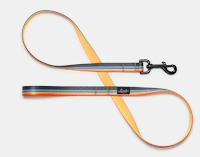 Add or mix n match a leash and you are good to go!